APH260 - LandOwner Share in Gated Community Beat the market rate by miles! LandOwner share in under construction super luxury gated community apartment township, right beside ORR . 6 Acre Gated community project under fast construction. If you are on the verge of buying & wish to SAVE several lakhs, that too WITH BANK LOAN not upfront payment, Contact immediately for details. Few Units of 1200sft 2BHK and 2000 SFT 3BHK are available to book. WHY WASTE MONEY?! 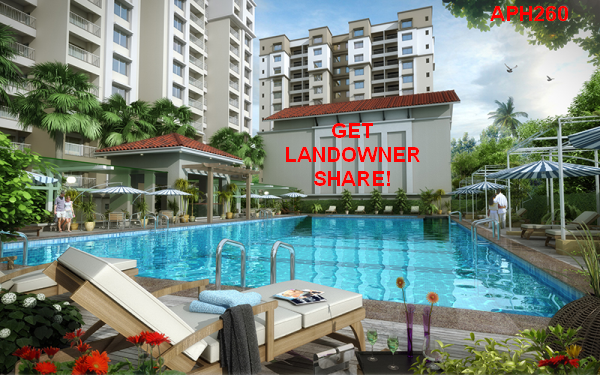 SAVE LAKHS BUY BUYING LAND OWNERSHARE WITH BANK LOAN! LandOwner is unable to wait till end of construction to sell. He needs cash during the construction period. He is willing to get paid through bank loan, but need commitment for 10 Units for him to give special rate. Use this opportunity and grab the deal! Site work in full swing. Apartments in prime Gachibowli, Kokapet, Narsingi areas has touched Rs.4250 to Rs.8000/sft for Gated Apartments. The Apartment prices have been going up consistently over the last 1 year, in Hyderabad. Before and after the election, there was long period of stagnation and prices in Hyderabad had fallen to lower than that in small towns, in other states. However, the price increase in Hyderabad over the past year is the highest in India. Suggest to grab this offer for 10 units at LANDOWNER SHARE RATE FROM LANDOWNERS Since it is approved, in prime location and you can get 80% bank loan and early delivery. In case of Self Funding, members shall follow same payment schedule as agreed by Bank for Bank Loan release. APH260. Apartment Project near ORR, beside Finacial District, Gachibowli- Hyderabad. Internal Doors: Teak Wood frame with Skin moulded shutter and hardware of reputed make. Windows : UPVC windows of reputed make with clear glass and safety grill in MS.
Internal Walls : Smooth finish with Altek or equivalent putty finish with two coats of acrylic emulsion paint of Asian make or equivalent over a coat of primer. External Finish: A combination of textured paint and acrylic based paints in two coats of reputed brand (Asian or equivalent). Electricals: Premium electrical fittings Clipsol / Legrand or equivalent. Plumbing: Jaquar or Equivalent bath fitting in all toilets. Kitchen: Granite Kitchen platform with stainless steel sink.